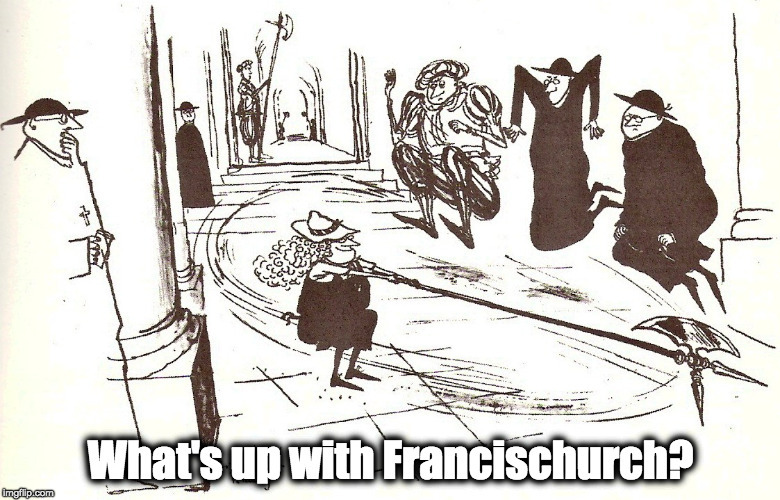 Like a roaring lion, seeking whom to devour… – What's Up With Francis-Church? Sure seems that way, doesn’t it? He’s very worldly. Creepy. It is all part of the NWO globalist, eugenicist, tyrannical agenda of control and oppression. The one world religion is essential part of this. Feeble it ain’t! It won us the Battle of Lepanto for starters! And didn’t an African bishop have some sort of vision that it would defeat Boko Haram? “More powerful than an atom bomb” was one description I read. And I rather think that applied to one Hail Mary, let alone the whole rosary. Grab your ‘weapon of mass construction’. Start praying. Sure. Nothing to see here. 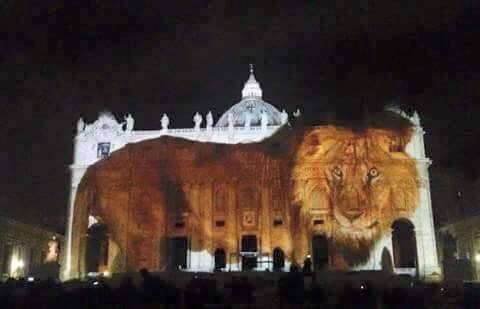 Is that the spirit of Cecil the Lion? Hey relax people. They were only pictures of fish, plants and animals, to remind all the people that we shouldn’t trash the earth. That’s not anti-Catholic. It could have been much worse – if they had projected images that were pornographic – that would have been real sacrilege! I guess we are to reach way deep into our Catholic treasure box and bring up the Rosary (again). It just seems such a feeble gesture though. Praying the same old thing. I want action! I want someone to storm the Santa Marta, or whatever the heck that brothel is called, and grab Francis by the scruff of his neck and fling him into the street. But because I’m a Catholic I guess I have to be merciful. So I’ll just take up that old tried and true Rosary and beg Our Lady to bring us a holy pope. For a guy who deems proselytizing “solemn nonsense” and sees no need for anyone to convert to Holy Mother Church when it comes to the eternal disposition of their souls, he sure is gung ho in proselytizing and converting the world when it comes to “climate change.” I suppose he considers one more important than the other. The only thing keeping me doubtful about MDM is the fact that it is illogical to reject Bergoglio as a false prophet when his predecessors supported the same basic heresies. None of those religious images are Catholic, I take it? Another sign from the Great Clarifier that Catholicism is not welcome in the FrancisChurch, perhaps? The primary artist behind the vatican light show, as well as the ghastly display on the Empire State Building, states explicitly that the “deities” of the Greeks, Romans, and Indians guide his work and that he contacts them through drug use.